Nineteen-year-old Liam PITCHFORD is aiming to secure his maiden Men’s Singles title at the 54th English Senior National Table Tennis Championships in Sheffield this weekend. The youngster from Derbyshire has already been a beaten finalist twice to fellow London 2012 Olympic Games team-mates Paul DRINKHALL, 23 from Loftus, and Andrew BAGGALEY, 30 from Milton Keynes. However, PITCHFORD’S rivals will be keeping a close eye on the English no. 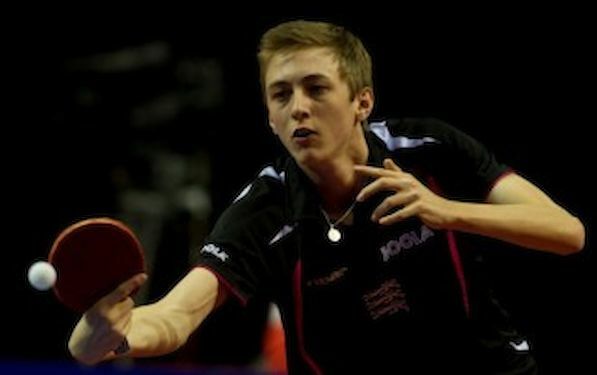 2 at Ponds Forge after the teenager recorded yet another international shock when he beat Korea’s KIM Minseok, ranked 34 in the world, last week at the ITTF World Tour Qatar Open. His reputation for giant-killing is starting to precede the world no. 157 following a catalogue of victories over some of the world’s biggest stars, including world no. 9 Vladimir SAMSONOV, no. 20 Alexey SMIRNOV, no. 32 Robert GARDOS and no. 51 Dimitrij PROKOPCOV. His international success hasn’t been replicated on the domestic stage with just a single Men’s Doubles and Men’s Under-21s title to his name, but he hopes that this year he can master the added pressure that comes from playing at home. Should the 19-year-old be successful in Sheffield he’ll continue his chase for medals at the Commonwealth Championships in New Delhi, India (5-10 May), where the England team have a great chance of medaling once more. Tickets for the English Senior National Table Tennis Championships are available on the door at Ponds Forge, Sheffield (1-3rd March) with free entry on the Friday, while Saturday prices are £6 for adults and £3 for concessions and Sunday prices are £8 for adults, £4 for concessions. You can alternatively follow all the action LIVE with coverage from the English Table Tennis Association. Regular twitter updates from @ettatabletennis will be supplemented by a livestream service of table 1 during the weekend. More details to appear on the ETTA website on Friday.